Joy and Refreshment in the Desert • Run Hard. Rest Well. En Gedi is a remarkable oasis in Israel. It is a place rich with spiritual significance. David hid from Saul there, experiencing intimacy with the Lord as he waited for the promise of his anointing to be fulfilled. An incredible military victory took place there as Jehoshaphat led a weaponless SINGING army. It is a place of great pain, suffering as well as joy and victory. 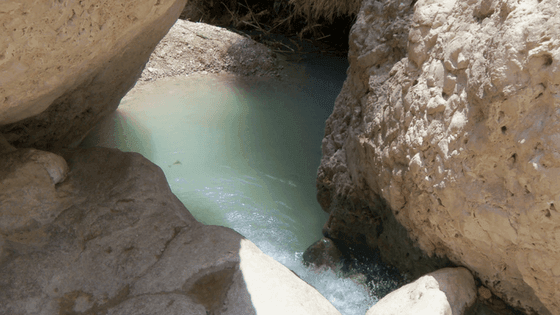 A great joy of my life was my first experience hiking in the hot, rocky desert of En Gedi, and all of the sudden hearing laughter, talking and splashing. As we walked toward the sounds of life, joy and refreshment, we ended up at the most amazingly refreshing pool where we splashed and swam with abandon–in the middle of the desert. To me, En Gedi is the absolute picture of the goodness of our God. He often places us in the desert by His design–to refine us, to grow us, to develop intimacy with us, to train us for battle, to fellowship with us in His suffering…and in the middle of these hard places, we find that He has put a “spring”–a place of refreshment and joy. Not always AFTER the desert but sometimes in the very MIDDLE of the desert. That is our desire for you…to experience an En Gedi Blessing–a beautiful and refreshing “spring” of our God–even in the middle of a desert. This post was written by Laurie Doden, a kindred-spirit and native of Ft. Wayne, Indiana. Thanks, Laurie! It’s adventure at its best – as we learn to run our race in a power not our own.